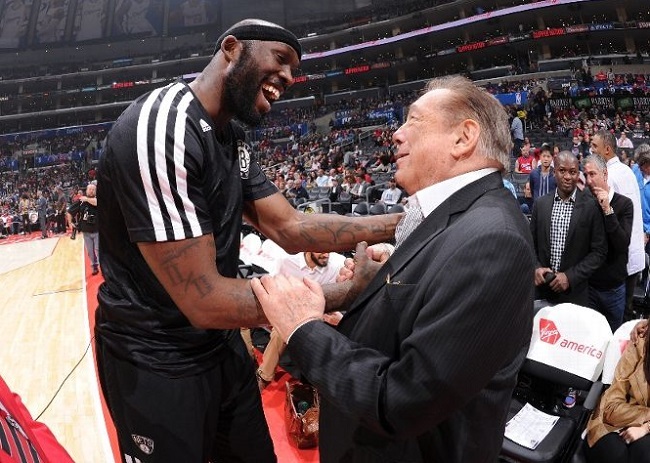 Clippers owner Donald Sterling (r) with former Clipper and current Kings PF Reggie Evans. Over the next few days, weeks, months — however long it takes NBA commissioner Adam Silver to rid his league of the stain that is racist Los Angeles Clippers owner Donald Sterling — a lot of people who don’t know much about Sterling will be kind enough to give the octogenarian billionaire free life advice and suggestions for where he can take himself and his anti-Black views. Snoop Dogg has already weighed in, with a 15-second Instagram post that had more passion and anger than his last four albums. LeBron James said the NBA does not have room for Sterling. Reverend Jesse Jackson suggested Clippers players and fans boycott the franchise; which would give Sterling his wish that Black people not attend his team’s games, but more importantly, would cause the kind of hit to his pocket that is sometimes the only way to get through to rich men. While other luminaries from the worlds of entertainment, sports and politics had their say as the Sterling story unfolded on Saturday and more of the man’s ugly side surfaced (or resurfaced) for the public to see, I came to just one conclusion: The only thing that can save Donald Sterling is Islam. I’m not talking about saving Sterling’s reputation or his business interests. There’s a chance that the recording of Sterling whining about his mistress’ audacity to “broadcast” her associations with Black people — even though she’s half-Black herself — will do irreparable harm to his already damaged public image and business relationships. I’m talking about saving Donald Sterling’s soul before it’s too late for him. The NBA can do its “due process” thing, and some people will always be there to remind us to wait until all the facts come out, but I think anyone with common sense knows that Sterling is obviously a racist. This incident with the mistress isn’t the first example of it. But as hard as it may be to break someone of Sterling’s age and arrogance of certain views, racism is still something that is taught and not inherited, and therefore it can be untaught. And for some people, God is the only teacher they’ll listen to. In his foreword to Habeeb Akande‘s 2012 book Illuminating the Darkness: Blacks and North Africans in Islam, Abdassamad Clarke wrote: “The deen (religion) of Islam is not only free of racism but is utterly opposed to it as the most aberrant form of jahiliyyah (ignorance). This is clear in the Quran, the Sunnah and in the extensive hadith literature.” Clarke, who is White, is the Dean at the Muslim Faculty of Advanced Studies in the United Kingdom. But I completely understand if the words of an Islamic scholar, the words of the last prophet of Islam, and the direct word of God from Islam’s holy book don’t do much to move someone who does not already follow Islam. Last year, former far-right Dutch political figure Arnoud Van Doorn converted to Islam. Last week, news agencies reported that his 22-year-old son Iskander also converted. Because of their new-found religion, both father and son have publicly abandoned their discriminatory and often racist political affiliations. Arnoud Van Doorn was once an aide to Holland’s far-right leader Geert Wilders, and in that role he helped produce an anti-Islamic film Fitna in 2008. Looking to prepare himself against the criticism he knew he’d receive, Van Doorn began studying Islam to back up the film’s criticisms of the religion. Through those studies, he says, he discovered the truth and became a Muslim. To put an American spin on it, this would be like Republican politicians Ron Paul and Rand Paul embracing Islam, maybe even becoming Democrats. As a recent convert to Islam myself, and as a Black man raised in the same United States in which Donald Sterling was raised and developed his distaste for Black people, I can testify that Islam has changed some of my views on race and race relations. While every religion will have its followers who are still misguided into racist, sexist, xenophobic and other bigoted behaviors, those faults reside with the individual, not with the religion. At least not with this religion. When I go to jummah prayer on Fridays and see Black Muslims, White Muslims, Asian Muslims, Latino Muslims, Indian and Pakistani Muslims, Arab Muslims and African Muslims gathering together and praying shoulder-to-shoulder, I see a religion free of the kind of racism that has poisoned the minds of men like Donald Sterling. The next few days, weeks and months could be hard for Sterling. He could be forced to sell the Clippers. He could be suspended into oblivion and irrelevance, as the NBA tries to distance itself from him like Major League Baseball treated former Cincinnati Reds owner Marge Schott. He could lose the respect of people he values. He could lose friends. He could lose money. Maybe the man who has lived the last three decades in the Hollywood spotlight will use this time to pick up the right book, watch the right program, or talk to the right person and find the light that will bring him out of his fear of the dark.